Ductless heat pump systems pump cooled or heated refrigerant directly to air-handling units through small pipes. Each living space has its own air-handling unit, and each unit has its own wireless electronic temperature controller. Here’s how the system works in a single room application. Indoor Unit uses refrigerant in the coil to cool or heat air and quietly delivers where you need it in the living room space. Outdoor Unit has an inverter-driven compressor pump that cools or warms refrigerant and sends it inside to an air handler through small pipes. Power and control wiring connects the outdoor to the indoor unit also. Wireless Controller conveniently allows you to adjust temperature, fan speed, and more… at the touch of a button. Control the temperature within any space using ductless models including wall-, floor-, and ceiling mounted options. Ducted options are available for larger or smaller zone conditioning. You can fine-tune your comfort while you save money by cooling or heating only the spaces you use. Slim, wall-mounted units provide individual room comfort control. Deluxe wall units are available with several energy saving features. Ideal for areas that are smaller or don’t have as much wall space. (Multi-zone applications only). Perfect for attics, sunrooms and rooms with low walls. Wider 4-way airflow pattern for better air distribution in a less obtrusive style. Perfect for bedrooms, offices, basements, sunrooms and additions. Provides low-profile comfort and efficiency while staying hidden in ceiling or floor. Perfect for master bedrooms, baths, additions, rooms with attics. Soffit or crawl space available. An assortment of models provide a wide range of cooling and heating capacity from 2,800 to 54,000 Btu/h. Each specifically designed to power a single-indoor unit for single room applications – or up to eight indoor units for multiple-room applications. More than 30 ENERGY STAR® certified systems including efficiency ratings as high as 33.1 SEER. All units are extremely quiet when compared to conventional models. Contact Redmond HVAC about which combination will best fit your cooling and heating needs. Multi-zone units allow you to create an oasis of comfort throughout your whole house in the rooms you use most. Each room (zone) operates independently with its own wireless or wired remote controller, or smart phone, so people in different rooms can choose the temperature that makes them most comfortable. Single rooms can now have ultimate comfort with the power of precise control over hot and cold spots. 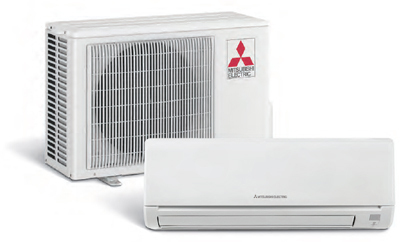 Contact Redmond HVAC to discuss which Mitsubishi energy efficient ductless mini-split system is right for you.